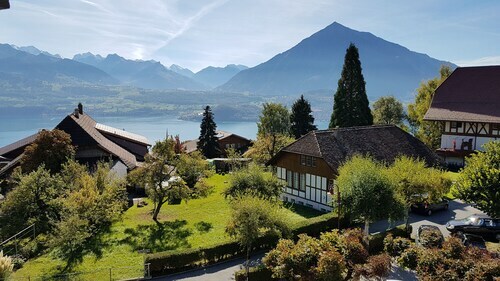 Situated in Krattigen, this hotel is 2.3 mi (3.7 km) from Lake Thun and within 9 mi (15 km) of Spiez Castle and Mystery Rooms. Tropic House and Seilpark Interlaken are also within 9 mi (15 km). 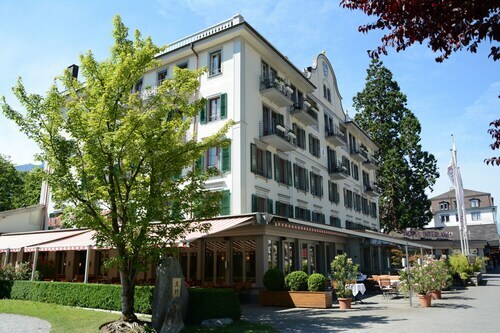 Located in Central Interlaken, this hotel is within 1 mi (2 km) of Interlaken Casino and Lake Brienz. Lake Thun is 2.2 mi (3.5 km) away. Interlaken Ost Station is 6 minutes by foot and Interlaken West Station is 14 minutes. 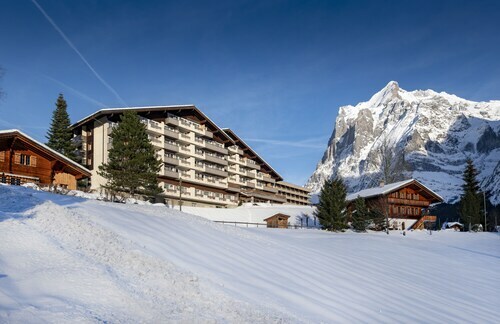 Located near the slopes, this Grindelwald hotel is in the mountains, within a 15-minute walk of Sportzentrum Grindelwald and First Cable Car, and close to winter sports such as cross-country skiing and skiing lessons. Pfingstegg Cable Car and Grindelwald Grund Gondola are also within 1 mi (2 km). Grindelwald Station is only a 1-minute walk. 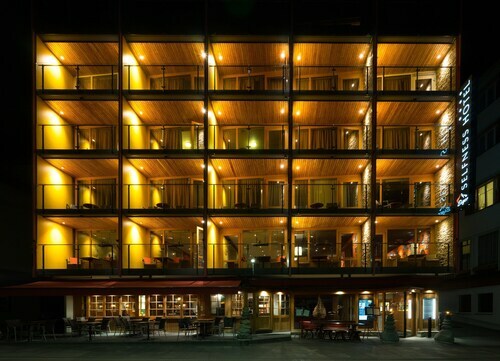 Located near the slopes, this Grindelwald hotel is in the mountains and within a 15-minute walk of First Cable Car, Pfingstegg Cable Car, and Sportzentrum Grindelwald. Grindelwald Grund Gondola and Pfingstegg Toboggan Run are also within 3 mi (5 km). Grindelwald Station is 9 minutes by foot. How Much is a Hotel Room in Krattigen? Hotels in Krattigen start at $150 per night. Prices and availability subject to change. Additional terms may apply. Are you researching a trip to Bernese Alps? Desire a place to lay your head? Travelocity's portal boasts many options. At the moment, Travelocity's user-friendly booking portal contains 18 hotels within a short drive of Krattigen's downtown area. 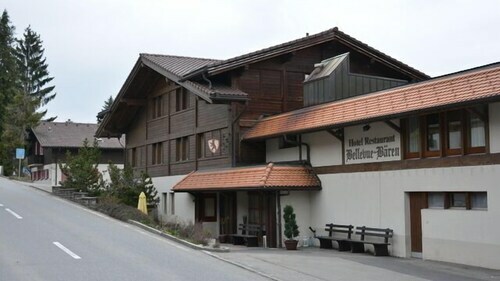 Some of the Travelocity-listed accommodation options that are near central Krattigen are the Dorint Blüemlisalp Beatenberg/Interlaken and Seehotel Jaegerhof Hubertus. 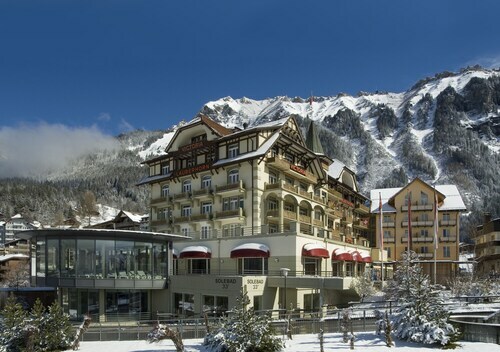 The Victoria Jungfrau Grand Hotel & Spa is located 6 miles (10 kilometers) from the city center of Krattigen. On the other hand, the Wellness & Spa Hotel Beatus is about 3 miles (5 kilometers) away. Some other hotel and apartment options worth checking out include the Beausite Park Hotel and the Eden Swiss Quality Hotel. After spending time in Krattigen, you could venture out to investigate the other natural and cultural attractions of the Western Switzerland area. Explore Western Switzerland's castles. Anyone with a love for the outdoors can also leave time to enjoy the region's lakes and mountains. Enlightened travelers in this region of Switzerland often enjoy snowboarding, skiing and cross-country skiing. 15 miles (24 kilometers) to the southwest of Krattigen, you can reach Adelboden, which is where you can visit Grossstrubel Mountain and Engstligenalp. 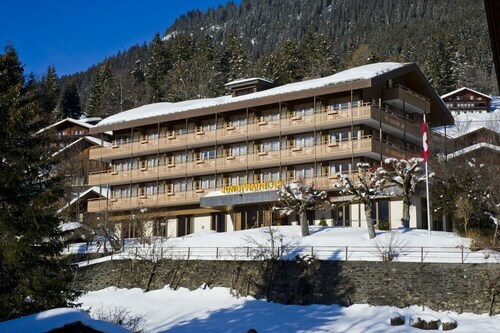 The The Cambrian and Parkhotel Bellevue & Spa are just some examples of the convenient lodging choices in Adelboden. 19 miles (31 kilometers) to the east of Krattigen, you will find Meiringen, which is home to the Hotel Wetterhorn and Panoramahotel Brünig Kulm & Tesla Destination Charging. While visiting Meiringen, be sure to venture to the Reichenbach Falls and Meiringen-Hasliberg Cable Car. Before saying your farewells to Bernese Alps, be sure you are able to watch some sport. Visit Stade de Suisse Wankdorf, found northwest of Krattigen. If you are thinking about staying in the neighborhood, book a room in the Hotel Bellevue Palace or Hotel Schweizerhof Bern. For modern travelers traveling via Belp Airport, you might find it convenient to book some accommodation at Apartments Justingerweg, or Hotel Sternen Muri, which can both be found a short ride away. This hotel was perfectly located... Fantastic views the pictures don't do it justice. Wonderful hotel and very friendly staff. It was a pleasure to stay there. I highly recommend for anyone traveling to the area! We loved our stay at the hotel. The location was close to the train station and convenient to down town. The room was clean and up to date. The staff were very helpful and friendly. Breakfast had many choices and the service staff were very good. The Victoria has an amazing pool and sauna. The only small complaint was the very stiff beds. I would definently stay again!! I chose to stay at Interlaken as a base for my travel up to the Jungfraujoch via the tunnel train. I was impressed once again by the general high quality of everything in Switzerland, the good-natured people, and the lovely hotel. 5.0 One of the best stay I ever had! Pleasurable, the staves are professional and attentive. Jungfraublick is comfort away from home!